Just recently I bought a little Jet BD-920N, but that thing is pretty light. It's nice for what it is, useful for small work. And its not REALLY a 9", either. If you measure the way SB/ Atlas do, it's more like a 6" LOL. The carriage gets in the way. What are you gonna' make with that? Table legs, metal bowls, bowling pins. Nice piece. Just got "back in." Had to drill the two screws out of the apron to get the apron/ carriage apart. When I get time, I'll clean 'er up. In pieces, I can actually get 'er into the basement. Very cool, let the shavings begin!! I would not want to haul that to the basement!! That's cool. I'm looking around for one myself. Good find. 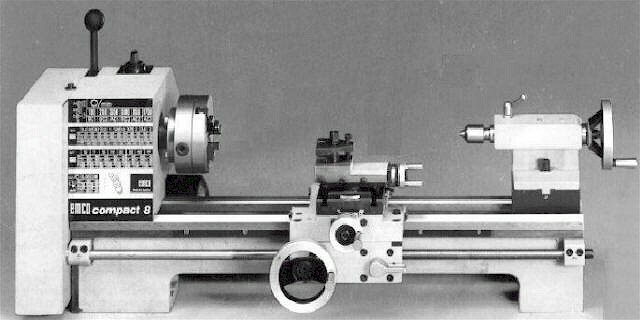 This lathe has an 8 foot bed and a 16 inch swing. I no longer need this lathe so it is time for a new home. That's FUNNY, but here's a true story. "Back when" the automakers were screwing with metricizing our cars, a mechanic came into the parts store, having just left our fasteners store. He had a bolt with a 10MM head so he KNEW it was metric, but nobody could ID it. He was a line mechanic an the CHEVY dealer. I finally smelled a rat, and sure enough, it was a standard 1/4" bolt, NC thread, with a 10MM head on the thing. THANKS GM!!!! Well I FINALLY, laboriously, got it torn down, some of it cleaned, and hauled, piece by piece, down to the basement where it will live. I don't have the time to restore it, and I wanted to get it together and make some test runs to see "where we are" on accuracy, wear, condition. If you compare to the original (Craigslist) photos, you can see the carriage, apron, ad bed are LOTS cleaner than they were. The compound on there right now is off the old 30's vintage 9". I thought it might be in better shape, but the slot is smaller, and the present tool post won't fit. Nice score. I grew up watching my grand father run one of those. He had a machine shop behind his house and would make replacement parts for cotton mills. He once was located at the mill but they decided to just set him up at his house since he had all the proper equipment. They would send a gofer back and forth to bring and pickup parts he made. Thanks. Very FIRST thing I'm gonna do is relocate the stupid switch. Some meathead went to a lot of trouble to drill and tap screws into the bed to mount it there, with the wiring in the way of damn near everything. I think I'll just mount it as far to the left on the chip tray as I can get. You can't even read the chart for the gearbox!!! Thats some cool stuff to have!